According to the American Psychological Association’s latest research, many Americans continue to seek out solutions for dealing with stress both at work and at home. If you happen to be one of those overstressed seekers, you may want to invest in ZAQ Diffusers. ZAQ Aromatherapy diffusers are designed to be used with aromatherapy principles, which have been previously proven to reduce stress. The diffusers themselves are very stylish and come in assorted designs. They include the ZAQ Noor Air Aromatherapy Essential Oil Diffuser, ZAQ Allay Air Aromatherapy Essential Oil Diffuser and the ZAQ Dew Air Aromatherapy Essential Oil Diffuser. Each ZAQ Diffuser in stock at Bombay Electronics is designed to run continuously for up to four hours at a time. Once the water level in the unit drops below a preset level, the diffuser shuts off automatically. As such, there is no need to worry about it running dry or wasting electricity. In addition, the aromatherapy diffusers add moisture to the air and do not generate condensation in the process. Therefore, they can help provide a comfortable environment for those prone to developing nasal issues, sore throats and dry skin. Those that want to factor color therapy into their stress busting routine as well should consider selecting the ZAQ Dew Air and the ZAQ Noor. Both feature a built-in light that changes color while the diffuser is in operation. The ZAQ Allay also has a built-in light. However, it does not change colors like the others. Nonetheless, it is still a very attractive aromatherapy diffuser. The ZAQ Diffusers are designed to be used with a variety of basic, signature and ultimate collection scents. Scent vials are currently not included with the diffusers. Therefore, they must be purchased separately. 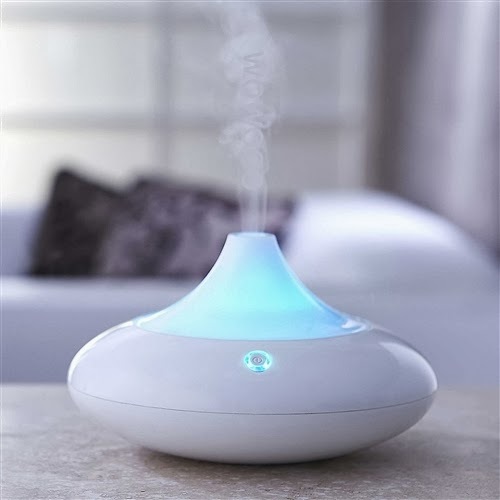 For relaxation purposes, scents that ZAQ Diffuser owners may find helpful are lavender, clary sage, jasmine and orange. To learn more about the ZAQ Diffuser, please contact us at (877) 736-6349.